Stinson's Golden Age is on the history of the Stinson 108 series airplane (the Voyager), although the Stinson 105, Stinson 10 and 10A, as well as the Stinson L-5, are also covered in great detail. 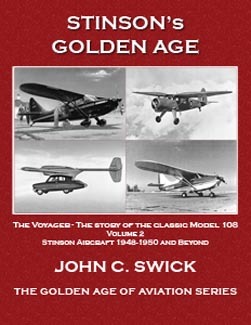 It begins in Stinson's Golden Age, Volume 1, with the three-place 105 in 1938 and concludes in Stinson's Golden Age, Volume 2, with the sale of the last Stinson 108-3 from Willow Run in 1950. Stinson's Golden Age includes production figures, the disposal of surplus military aircraft, the all-Piper Apache and the chronicle of two Stinson dealers are all included to give the reader a better sense of the Golden Age of Aviation. Stinson's Golden Age, Volume 2 includes: Piper-Stinson; production history; selected profiles; production change points and color specs; dealer listing; vintage ads and articles. Historic Aviation: "....rich narrative and colorful histories." Mr. Swick is well known for his particular attention to detail and historical accuracy. He spent 100s of hours carefully researching the Stinson Aircraft history, and has a very readable style in weaving together the details of Stinson's Golden Air.